Nissan has been backing away from the battery manufacturing factory they built in Tennessee, and overall the Nissan-Renault-Mitsubishi Alliance haven&apos;t had a common battery supplier. This investment is for Silicon-dominant Li-ion batteries which may mean it&apos;s an investment in the future, and will not help current battery supply issues. But it points to a future where the Nissan-Renault-Mitsubishi Alliance hopes to be leaders in electric vehicles. Enevate&apos;s silicon-dominant Li-ion technology features extreme fast-charging capabilities with high energy density and improved safety. Francois Dossa, Alliance Global Vice President, Ventures and Open Innovation, said: "We are pleased to participate in Enevate&apos;s latest funding round. This strategic investment allows us to support the development of Enevate proprietary cutting edge electrode technology. Continued development in this critical field will help us accelerate the electrification of our vehicles." The investment reflects the capability of Enevate in breakthrough Li-ion batteries capable of extreme fast charging with high energy density. Enevate&apos;s technology, which could enable electric vehicles (EVs) to charge in the same time as refueling conventional cars, is seen as a leader in its field. "We share the common goal of making electric vehicles easier to use and adopt in mass markets," says Enevate President and CEO Robert A. Rango. "We look forward to our strategic partnership with Renault-Nissan-Mitsubishi, as they are a global leader in electric vehicles and they understand the market needs of EV consumers worldwide." Enevate&apos;s HD-Energy® Technology for EVs features five-minute fast charging with high energy density and long driving range with added focus on low-temperature operation for cold climates, low cost and safety benefits. This short charging time is superior to any other Li-ion technology available today. Enevate Corporation, with global headquarters in California, USA, develops and licenses advanced silicon-dominant Li-ion battery technology that revolutionizes the electric vehicle (EV) market by breaking down barriers to EV adoption. Enevate&apos;s pioneering work on silicon-dominant anodes and cells has resulted in its breakthrough HD-Energy® Technology featuring extreme fast charging with uncompromised high energy density, excellent low-temperature operation for cold climates, low cost, and safety advantages over conventional graphite Li-ion batteries. Investors include: Mission Ventures, Draper Fisher Jurvetson, Tsing Capital, Infinite Potential Technologies, Presidio Ventures – a Sumitomo Corporation company, CEC Capital, Samsung, Lenovo, LG Chem, and the Alliance (Renault-Nissan-Mitsubishi). Enevate, the Enevate logo, HD-Energy, and eBoost are registered trademarks of the Enevate Corporation. To learn more about, or to license, Enevate&apos;s industry-defining battery technology, visit www.enevate.com. 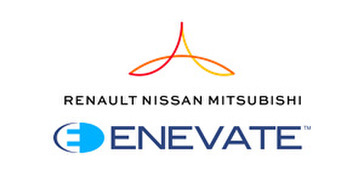 Groupe Renault, Nissan Motor Company and Mitsubishi Motors represent the world&apos;s largest automotive alliance. It is the longest-lasting and most productive cross-cultural partnership in the auto industry. Together, the partners sold more than 10.6 million vehicles in nearly 200 countries in 2017. The member companies are focused on collaboration and maximizing synergies to boost competitiveness. They have strategic collaborations with other automotive groups, including Germany&apos;s Daimler and China&apos;s Dongfeng. This strategic alliance is the industry leader in zero-emission vehicles and is developing the latest advanced technologies, with plans to offer autonomous drive, connectivity features and services on a wide range of affordable vehicles.